This image, captured by NASA's Cassini spacecraft on Jan. 16, 2015, shows Saturn's shadow barely reaching across the planet's famous ring system. 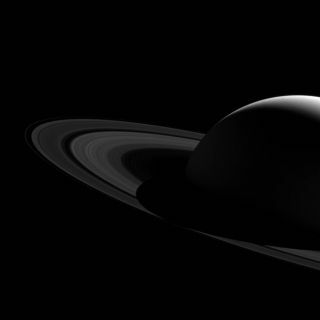 Saturn's iconic rings disappear into shadow in a gorgeous image by NASA's Cassini spacecraft. That shadow, cast by Saturn itself, extended far beyond the rings for years after Cassini reached the planet in 2004. The shadow began to shrink in 2009, after the planet's equinox (when the sun was directly above Saturn's equator). The newly released photo captured the moment, on Jan. 16, 2015, when Saturn's shadow just barely reached across the entire ring system, NASA officials said. "The shadow will continue to shrink until the planet’s northern summer solstice, at which point it will once again start lengthening across the rings, reaching across them in 2019," agency officials wrote in a description of the photo Monday (Sept. 12). Cassini was about 1.6 million miles (2.6 million kilometers) from Saturn when it took the image, which features a resolution of 90 miles (145 km) per pixel, NASA officials said. The $3.2 billion Cassini mission — a joint effort of NASA, the European Space Agency and the Italian Space Agency — launched in 1997 and arrived in the Saturn system in July 2004. The Cassini mothership also delivered a lander named Huygens onto the surface of Saturn's huge moon Titan in January 2005. Cassini will continue studying the ringed planet and its many moons until September 2017, when its mission will end with an intentional death dive into Saturn's atmosphere. This final maneuver is designed to ensure that the spacecraft doesn't contaminate Titan or fellow moon Enceladus, both of which may be capable of supporting life, with microbes from Earth.